As we entered 2019, a push for dispossession caught the nation by storm. Brendan Hurley, manager of Goodwill Industries in the Washington, DC area, observed a 66 percent increase in donations to his stores over the weeks that followed Netflix’s Tidying Up with Marie Kondo’s introduction to the streaming platform on New Year’s Day. While an unforeseen national move to declutter could be an unrelated spontaneous action, this new anti-material effort sweeping households is usually attributed to Tokyo’s Marie Kondo and the dissemination of her KonMari method. Decades into an era known for its ubiquitous consumption, this move to simplification reminds one of accumulation’s drawbacks. Perhaps there is some irony to the show being a product, serialized in its form, that speaks to this issue. And yet for all its roots in consumerism, Kondo’s questioning of our relationship to commodities exists alongside a conversation with their real purpose—tangible and otherwise—making necessary social change no longer implausible. Tidying, as the title suggests, is central to the show—encompassing the assessment of possessions, their placement, and their presentation. Kondo frames the act as a step toward cultivating a happy home and a functioning family. As we are entrenched in and overwhelmed by the sheer volume of objects we live with, the cases explored on the show work towards the alleviation of object-induced anxieties. A tidy house, most would agree, is a space conducive for happiness.The process of tidying illuminates an unanticipated aspect of how untidy homes exasperate existing societal disparities. We come to understand how people relate to their stuff and how, in the absence of healthy relations, some, more than others, must compensate to keep a household afloat. The domestic space upholds gender roles that delegate the emotional burden of clutter—and decluttering—to women. Tidying Up follows women in careers across the workforce who are always strained by the disproportionate weight of the home. With this reality, it can be inferred through Kondo’s messages, a tidy house may offer itself as an equalizer—from order, an unrealized equitability among partnerships. In the vein of popular self-help and home improvement shows before it, Kondo’s addition to the genre offers an aspirational view into the lives (and changes to them) of people not so unlike you and I. What is unexpected, however, is the way in which this show—more than its predecessors—presents personal application of its ethos of cleaning. A philosophy first and foremost, the KonMari method is intended to be accessible. The traditional self-help or home improvement show features experts imposing certain value judgements on the subject and providing a new (and improved) way of life. Still, even in the absence of a strong aesthetic projection (that might take the form of purchases or renovation) on Kondo’s part, the before-and-after element of the show is consistent with the genre’s form: after an emotional journey a big reveal concludes the episode, fulfilling audience expectation. Regardless, Kondo explicitly does not enter a home with the intent to personally make any changes. Instead, she applies the principles outlined in her book, The Life-Changing Magic of Tidying Up: The Japanese Art of Decluttering and Organizing, to each episode’s family, assigning her clients the task of wrestling with their possessions and encouraging them to orient their practice of tidying around their personal relationships to objects. Each episode follows a new family—mostly couples (some with and/or expecting children), but also one woman whose husband has recently passed—and their personal relationships to clutter. The houses range from small apartments to the villas of suburbia, homes just moved into and homes lived in for over 50 years. The clutter sometimes overwhelms, creating narrow pathways through a house, while other homes maintain a veneer of tidiness over jumbled drawers and closets. A delightfully eager Kondo (accompanied by her charming translator, the show’s unsung heroine, Marie Iida) enters each home and after a short discussion on the family’s goals, greets the house with a moment of closed-eye silence. Then, Kondo guides each family through her five-step process and we, the audience, come to understand Kondo’s process of declutterAing. Across the families, the willingness and ease with which they engage varies. 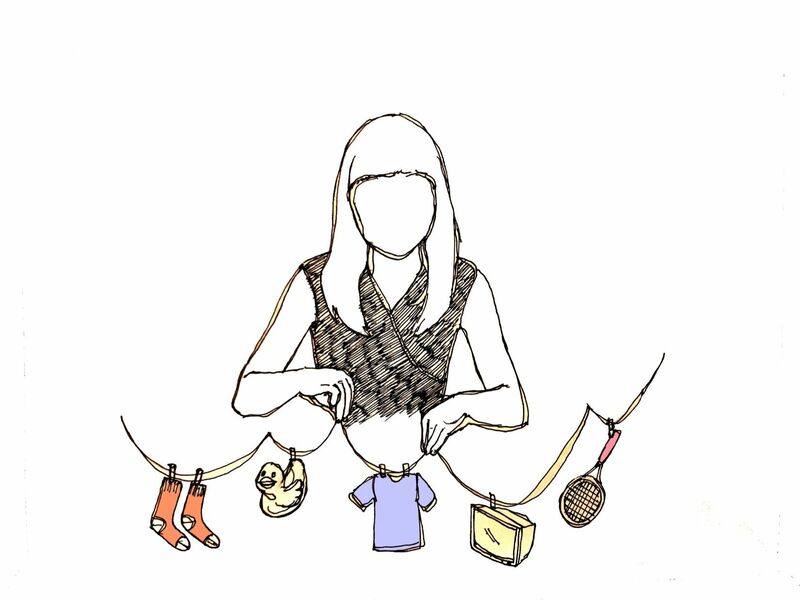 The first step in Kondo's process, clothes, becomes central to each episode. After piling all of one’s clothes on the bed, one asks, “Does this bring me joy?” Kondo illustrates how joy should make one feel by holding a beloved object of her own in hand and responding viscerally to her own love for this same object. In the absence of this sensation, she suggests thanking it before letting it go as to assuage guilt or bad feelings one might have from parting with it. This phase demonstrates her folding, a throughline across the series. As in her book, she details how each item should be folded all with the goal of visual order, easy access and, of course, that elusive feeling of sparkjoy. This general approach follows the families through the categories: books, papers, komono or miscellaneous, and memorabilia. Five of the show’s eight episodes follow heterosexual couples (and thrice their families) naturally exploring the gendered dynamics of domesticity. Even when the homes are found in rather unalarming states of chaos, their untidiness reveals the burden of labor on the women who preside over it. The interviews with the male partners conducted aside from the process exhibit mere annoyance or frustration while the moments with the female partners showcase a tremendous pressure and acceptance to failure in spite of unrelenting efforts. Kondo inquires as to how Katrina envisions the future, and as Katrina anticipates holding the reins of the family, Kondo intervenes with her own goal of a home crafted by and serving all members of the family. In reflection Katrina states: “I wasn’t setting myself up to win. As a mom, I was doing too much I was being a make-it-work maker, not a home maker…no one person can do it all…I think they will be more proactive now that they have a sense of where things are.” While still very much at the helm at the family, we observe Katrina—with the burden of combating clutter no longer her task alone— renew her intentions to provide the best for her family manifested in a continued sense of tidiness. It is clear that the barrier between Katrina and a comfortable home was the labor—both mental and physical—which she endured for the continued functioning of her household; but at what cost? This work of untangling messes is an unnecessary strain on a woman whose efforts are better spent elsewhere, in Katrina’s case, pursuing her career and building on her loving familial relationships. With a tidy house and a KonMari-esque relationship to objects, one can begin to see a world where one’s stuff no longer precludes self-fulfillment. In Kondo’s tidy home, the burden of clutter dissolves, allowing for a fresh start where equitable distribution of labor begins to be possible. She stresses, in this episode, that the responsibility of tidying is on the entire family—but in order for them to develop that habit, they must build spaces around their wants and question their possessions. An obstacle to this self-interrogative relief is the shallowest embrace of the KonMari method: the notion that Kondo envisions tidiness as something regimented. While Kondo offers guidelines for the practice, the process self-generates, with all actions of the family’s own volition and done in the absence of Kondo and cameras over weeks or even months. This reimagining by skeptics of Kondo and her ideology is unfounded and ultimately contrary to the charming, sensitive, and tactful approach she recommends to her clients. Twitter audiences have specifically criticized her suggestion that families limit the number of books on their shelves to 30. A fear of anti-intellectualism and the image of book burnings ignite robust backlash to this nudge toward self-curation. But, while Kondo, like many people, enjoys the feeling of book lined walls, Kondo sees an incredible waste of books remaining on shelves unread, unshared, unborrowed. The KonMari method should not necessarily lead to a minimalist household. In fact, if an organized clutter resulted, the better! All that changes: the tidyer’s relationship to the objects. Everything, Kondo argues, should have a purpose, and if that purpose is its spark of joy, that is function enough. One might even envision a future, many tidies forward, in which our whole cultural connection to objects has evolved. As a viable approach to equalizing labor distribution in households, KonMari may have further benefits. As the world’s resources are increasingly depleted, a more tactful and joy-sparking connection might be the subtle transformation our consumption-heavy society needs to evolve away from the material while conserving an experiential quality of life. Kondo often brings boxes and boxes into her client’s home to break down drawers. She sorts her objects by size and function. The clarity of this compartmentalizing reflects the corresponding mental shifts that Kondo aims to inspire. Envisioning spaces as not merely tidy but as stepping stones toward improved futures is integral to Kondoite home improvement. The KonMari method entered American cultural consciousness to applause and uproar. Embrace it, thank it, or find a more suitable box. NICKOLAS ROBLEE-STRAUSS B’22 folds his socks.